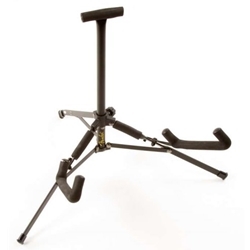 The Fender mini guitar stand for electric gutiar folds to fit into most gig bags or cases and holds most standard-shaped guitars. Velveteen rubber protects your guitar's finish. Deluxe satin finish.